For members of ATD-LA, ATD-SD, ATD-IE ISPI-OC and ISPI-LA. ATD National members are NOT eligible for the affiliate rate. Total Trainer: Creating Training is a series of ten workshops that helps training professionals improve their ability to design and develop training. To help attendees become more well-rounded training professionals, a small portion of the class is devoted to delivering training as well. WHY IS IT WORTH MY TIME? Taught by senior training professionals from the ASTD‐OC community, the program takes participants from the initial needs analysis through the evaluation of the training. If you’d like to enroll for both Total Trainer courses ~ Creating Training + Delivering Training ~ at this time, you’ll receive an additional $100 discount, as well as early bird discounts off both programs. 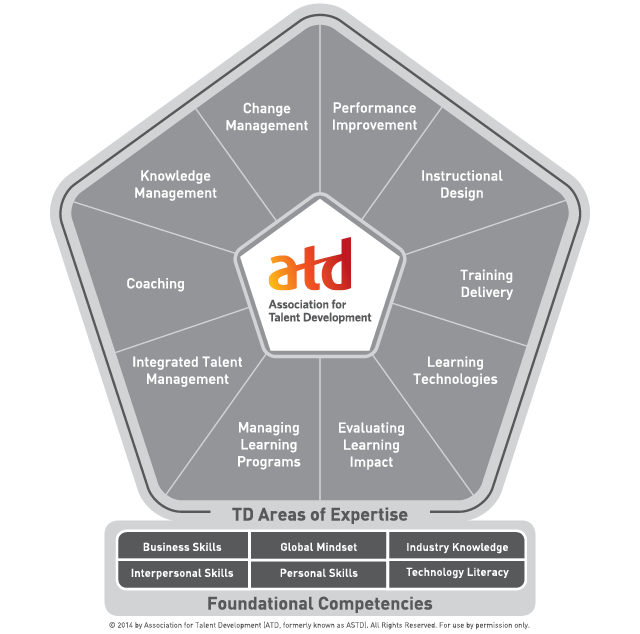 To find out more about the ATD Competency Model for the Training and Development Profession, visit http://www.astd.org/Certification/Competency-Model. Take your knowledge to a new level and get access to exclusive info about the Competency Model for ASTD National members by becoming a Power Member (member of the Orange County Chapter and National). Find out more here. Cancellation/Refund deadline is March 28. No shows will be charged in full.